The lentils are soaked for at least 24 hours, which makes them edible without having to be cooked. Therefore, the cooking process can be short and scorching, to give them a smoky flavor — no lentil soup here. 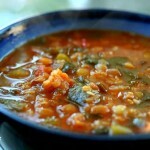 Eggplant also does well when smoky, so it nicely compliments the scorched lentils. The fresh herbs, garlic, lemon, olive oil and kosher salt serve as a sort of dressing, and you can adjust the quantities according to taste. These quantities will yield 2.5-3 cups of lentil salad. 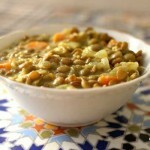 Start the lentils a day in advance: Put the lentils in a bowl and cover with water. About 8 hours later, dump out whatever water hasn’t been absorbed by the lentils, and rinse. Repeat every 8 hours or so, until you’re ready to use the lentils. They should start to sprout within 16-24 hours. If you really want little sprouts (this isn’t necessary), start soaking the lentils 36 hours or so before you plan to use them. Cube the eggplants, put a small amount of oil in a frying pan or a wok, and start stir-frying the eggplants on high heat, stirring so that they don’t burn. The eggplants should start to sear and brown. Once the eggplants are soft, add the lentils. Don’t add any extra oil — the point is to sear the lentils, not fry them. 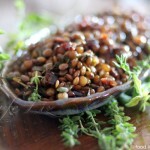 As the lentils cook, you should see their skins wrinkling and developing dark brown spots. Stir frequently to keep the lentils from burning. Once most of the lentils looked seared, toss in the carrot — it should still be crunchy when you’re done cooking. You can add the crushed garlic now, or save it to add after the cooking is done, if you like an especially strong garlic flavor. Stir-fry for a minute or two with the carrots, then turn off the heat. Add the lemon juice, garlic (if you haven’t already), chopped parsley and chopped mint, and sprinkle with kosher salt and fresh black pepper. Adjust these seasonings to taste — you might want to add more lemon juice or garlic, for instance. Serving suggestion: Serve alongside yogurt (this makes the recipe dairy, and not parve or vegan). 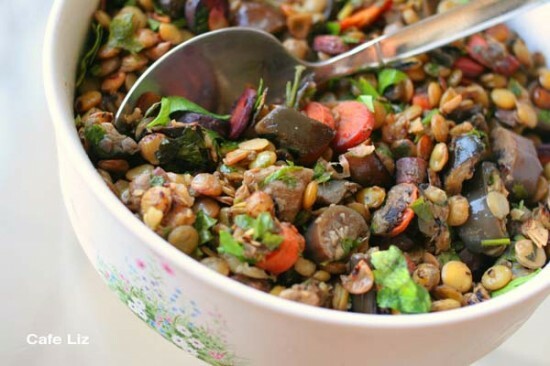 7 Responses to "Seared lentil salad with eggplant, carrot, parsley and mint"
I have to say – This dish suffers from an issue very common to vegan/vegetarian food: It looks like a brown lump, or a lot of such lumps put together. You tried it though, no? At Fritz’s? I actually thought it was quite colorful, albeit a little difficult to photograph. I actually have their recipe for that: 1/2 c cashews, 3 T lemon juice, 1/4 c water, 1/2 c canola oil, salt, all blended together. Given that it’s basically cashew tahina, it’s no big surprise that it tastes good …. anyway, I think vegan/vegetarian food is best when it’s not trying to replace meat, and is just trying to be good in its own right. Yeah, you can generally say that cashew-ANYTHING tastes good. Very delicious picture. 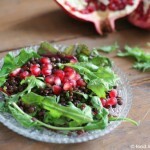 I love these quick wholesome recipes, for these are the kind i have for my lunch everyday! Love roasted/smoky eggplants. Had this by Sophie, it came out really good. Also goes well with fetina type cheese.